Smallmouth Bass (SMB) fishing in the Staunton River in 2017 should continue to be average to good. Strong year classes produced in 2007, and average year classes in 2008 and 2009 should provide anglers with good catch rates of SMB 14” and greater. The 2015 year class was very good, so catch rates should remain consistent in the short term and should improve in two years when the 2015 year class enters the fishery. Unfortunately, the 2016 year class declined to one of the lowest levels measured in 20 years. Hopefully, the strength of the 2015 year class will compensate for this. Consistent numbers of SMB over 16” have existed in the Staunton for the last 15 years, so anglers still have great opportunities to catch quality fish in this stretch of river. Growth rates are above average, and survival is good which helps the Staunton River be a consistent producer of big fish. Population estimates performed late summer 2013 indicated the SMB population declined somewhat since surveys in 2006, but the population is still very healthy. The Staunton has excellent habitat in the reach above Brookneal; anglers new to the river should concentrate on the abundant rocky habitat as well as submerged trees extending from river banks. The river also holds a number of Spotted Bass, and the chance to catch a spot over 12” is very good especially in the lower river below Brookneal. In addition to black bass, anglers in the Staunton River will find fishing for Channel Catfish and Flathead Catfish to be excellent. Catfish are well distributed throughout the river and should be available from shore and boats. A Striped Bass spawning run from Kerr Reservoir also provides a very popular and unique fishing opportunity in April and May. Occasional catches of Walleye and Saugeye are possible especially from Leesville Dam to Altavista. Recruitment for Smallmouth Bass (SMB) in the James River was below average again in 2016. High flows towards the end of June likely had a negative impact on the spawn. However, the 2014 year class was highly prolific, especially in upper river sections and should persist for the next three to five years. Riverwide, catch rates of adult SMB nearly doubled from 24 fish/hr in 2015 to 45 fish/hr in 2016. Densities in the upper river (above Lynchburg) averaged 75 fish/hr. What this means for anglers in 2017 is that they can expect to catch, on average, double what they normally do including lots of 12 to 16” inch fish from Lick run to Lynchburg. SMB in the lower section (below Scottsville) were still present, but densities declined as habitat transitioned from the mountain region to the piedmont and coastal plain. Larger SMB (16”+) are becoming very abundant in the upper sections of the river (above Lynchburg) where fishing pressure is light. Flathead and Channel Catfish remain abundant from Lynchburg down through Richmond with large Flatheads (20+ pounds) quite common at Lynchburg and Bremo Bluff. Rock Bass abundance increased in certain sections of the upper James, mainly at Big Island and above, while Redbreast Sunfish densities were low compared to historical levels but remained common up river. Muskellunge catch rates continued to increase on the upper James from Lick Run to Lynchburg. Most fish were in the 36 to 44” range. Biologists have reward tagged muskies in the James River, so if you catch one with one or two yellow tags, please mail them to the address on the tag for a $20-$40 reward. For more detailed information, please see 2016 James River report. On the New River upstream from Claytor Lake (Upper New River), abundant young Smallmouth Bass (SMB) will contribute to angler catches in 2017 with good numbers of 7 to 14” fish. The section from Buck Dam to Allisonia is the best area of the Upper New for SMB with excellent numbers of 14 to 20” bass. During spring 2016 electrofishing from Buck Dam to Allisonia, 35 percent of SMB collected by biologists over 7” long were also over 14”, and 13 percent were over 17”! Walleye fishing is best from Fries Dam to Allisonia where the Department concentrates stocking efforts. Anglers catch good numbers of walleye in this section from February to April with Foster Falls a prime location. The bulk of walleye catches in spring 2017 will be 14 to 17” fish from the most abundant recent stocking in 2014. Rock Bass and Redbreast Sunfish provide fun fishing opportunities particularly from Mouth of Wilson to Fries where these sunfish are more numerous. In pool areas from Ivanhoe to Allisonia, anglers can catch Channel and Flathead catfish which are more numerous upstream from Claytor Lake. The New River below Claytor Lake should produce good catches of Smallmouth Bass (SMB) up to 15” in 2017 with an opportunity to catch a few larger ones. Bass fishing should continue to improve during the next few years with above average SMB spawns during four of the last eight years. Top locations are Whitethorne to Eggleston in Montgomery and Giles counties, and Pembroke to Pearisburg in Giles County. Good areas for panfish include Claytor Dam and Whitethorne in Montgomery County, and Pembroke to Pearisburg in Giles County. Muskie fishing in the New River should continue to be fantastic in 2017. The upper New muskie fishery, from NC to Claytor Lake, is maintained by annual stockings with the goal of developing a naturally reproducing population so that stockings can be curtailed or discontinued. There are plenty of muskie to be found in the large pools throughout this section. The lower New, from Claytor Lake to WV, contains a reproducing population of muskie and has not been stocked since 2011. Muskie over 50” can be caught, but the majority will be between 35 and 42”. This size group is extremely abundant right now and will continue to offer great fishing for years to come. A new muskie regulation went into effect on January 1 for the lower New River. All muskie below 48” must be returned to the river from March 1st through May 31st. During the rest of the year, all muskie between 40 and 48” must be released. The harvest limit remains one per day. Please be aware that muskie are not a real hardy fish, and catching one when the river temperature is 80 F or above can lead to death of that fish if not quickly brought to the boat and released. Many dedicated muskie anglers will not fish for them during summer. Questions about muskie and muskie management can be directed to Joe Williams at joe.williams@dgif.virginia.gov. The Clinch River should provide excellent fishing opportunities in 2017 for Smallmouth Bass (SMB), Walleye, and Channel Catfish. The catch rate for SMB in spring 2016 samples was up from 2015 and was among the highest observed in a decade. The relative abundance of SMB in 2016 samples increased at all sampling sites but was highest in the reach from Fort Blackmore to Dungannon. Size distribution also improved with more large fish in the population. Nineteen percent of adult fish were greater than 14”, and 4% were 17” or longer. Walleye numbers continued to increase in spring samples with the 2016 catch rate being nearly three times higher than any observed in the past 12 years. This increase is likely the result of consistent stocking over the past few years and good survival. The 2016 sample produced relatively large numbers of Walleye in the 15 to 17” range with some exceeding 22”. Good numbers of these fish will have reached the 18” minimum length by 2017. Although Walleye can be found throughout much of the river, anglers fishing in the areas of Fort Blackmore and Dungannon are likely to have the greatest success. Sampling efforts also indicate that anglers wishing to target Channel Catfish should have good success in deeper pools. Good fishing opportunities for Rock Bass and Redbreast Sunfish can be found all along the river. 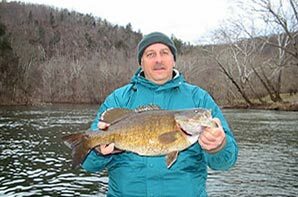 The fishing outlook for Smallmouth Bass on the North Fork Holston River is bright for 2017. Boat electrofishing catch in 2016 was an impressive 147 fish/hour. Size structure was excellent at the three sites sampled, but low spring flows limited access to Mendota which traditionally offers some of the best bass numbers the river has to offer. Fishing the Maury River in beautiful Rockbridge County is always a good choice. Fish populations are extremely consistent from year to year, and anglers should expect high catch rates of Smallmouth Bass, Rock Bass, and Redbreast Sunfish when fishing in 2017. Biologists observed plentiful numbers of SMB in the 12 to 14” range during spring 2016 raft electrofishing surveys. DGIF data showed an increasing trend in quality-size fish. In 2017, anglers should expect to encounter above-average numbers of SMB 12” and above. The Maury offers excellent habitat for SMB and sunfish throughout its 30-mile journey to the James River in Glasgow. Anglers may also find themselves “reeling in” a Green Sunfish, Pumpkinseed Sunfish, Fallfish, or Largemouth Bass, as these species are also quite common. Harboring high densities of scrappy fish, the Maury is a great place to take novice anglers or a child on their first fishing trip. With big fish numbers up, serious “river-rat” anglers should definitely plan at least one float trip on the Maury in 2017. The South Fork and Mainstem Shenandoah Rivers are known in angler circles as a “numbers” fishery, meaning anglers can expect to catch a reasonable amount of bass and sunfish on any given day. Based on the most recent VDGIF 2016 fall sampling, it appears the Smallmouth Bass (SMB) fishery has recovered nicely from the disease/mortality event that occurred spring 2014. The number of adult SMB greater than 11” is currently above the 19-year average. Most of these fish came from above average spawning success in 2010. The number of smallmouth greater than 14” collected also increased from 2015 to 2016 by 34 percent. Biologists documented a large number of SMB in the 7 to 8” range during 2016 fall fish population monitoring. These 7 to 8” bass are from a record 2014 spawning year and should grow up to 10” throughout the 2017 summer. There was also good spawning success in 2012, and these fish (10 to 12”) offer anglers a better size fish to target. Spawning success was below average in 2008 and 2009, so even without the 2014 disease event; there would be low numbers of bass greater than 15” in 2017. Successful SMB spawning in 2010 and 2012 improved fishing the past two years. Barring any fish disease outbreaks, the population should continue to improve over the next two years. Spawning success in 2016 was average when compared to the last 20 years. The 2016 year class should help maintain smallmouth numbers in the future. Thus, SMB catch rates in the South Fork and Mainstem Shenandoah Rivers should be above average compared to recent years with a lack of larger (> 15”) fish. Anglers should also expect good catches of Redbreast Sunfish. Anglers should not overlook Largemouth Bass, as this river harbors a quality population; and finding good numbers of 2 to 4 pound fish should not be difficult if deeper, slower sections when woody debris are targeted. Anglers again reported fair musky catches and sightings in 2016 mostly in the longest and deepest pools. Channel Catfish in the 2 to 6 pound range are common, and anglers should concentrate on the lower South Fork and Mainstem when targeting catfish. There is always the strong possibility of a mixed bag on the Shenandoah. Don’t be surprised if you catch quality-sized Pumpkinseed, Bluegill, Green Sunfish, Fallfish, Black Crappie, or even a Walleye. In spring 2014, VDGIF began stocking walleye fry in the Shenandoah River annually to supplement the natural population and increase the number of walleye present. Sampling indicated low survival of the 2014 stocking. However, the 2015 stocking seems to have survived well; and anglers should expect to see an increase in the catch of walleye in 2016 and 2017. Due to a shortage of supply, walleye were not stocked in 2016. Most 2014 and 2015 stocked fish should reach legal harvest size during 2017. As future annual stockings are added to the Shenandoah River, the population should increase to an acceptable fishery. Anglers fishing for walleye on the Shenandoah River should focus their efforts in the deeper pools during daylight hours. Walleye will move out of the deeper pools into shallow bedrock ledge areas to feed at night. Consistent spawning success should also aid in improving the Smallmouth Bass (SMB) population in the North Fork Shenandoah in 2017. Anglers should mostly encounter SMB in the 7 to 8” range from the 2014 year class. These fish should grow to between 9 and 10” throughout 2017. There is always the possibility of encountering larger fish when fishing the best habitat. Fallfish are plentiful in some sections of the North Fork, can exceed 14” and should not be overlooked. Anglers may also encounter adequate numbers of Redbreast Sunfish in most areas, Bluegill in deeper pools, and the opportunity to catch a quality-sized Largemouth Bass, Channel Catfish, or musky. Pool habitat is limited, so seek out deeper water when targeting these species. If you plan a float trip here; stick to spring and early summer, as low flows and possible dense vegetation can make fishing and navigation difficult later in the year. Anglers should experience average Smallmouth Bass (SMB) catch rates in 2017 on the Rappahannock and Rapidan Rivers – at least for larger fish (perhaps above average for smaller). SMB electrofishing catch rate was 36 fish/hour in fall 2016 which was slightly below average. Big fish numbers were finally trending down after older, strong year classes began to diminish. However; several citations were collected in the wayside park within Fredericksburg city limits below the old dam site – this reach adjacent to the city’s new multi-use trail continues to hold astonishing numbers of big bass. SMB recruitment in 2016 appeared good which followed excellent spawns in 2015 and 2014. A trend of poor year classes was finally reversed after spring flows dictated below average year classes in five of seven years spanning 2008-2014. These strong year classes should lead to improved fishing for years. There are plenty of Channel and small Blue Catfish to be caught for that camp dinner from well above the junction on both arms downstream to Fredericksburg, and Redbreast Sunfish are plentiful. Anglers may encounter small Striped Bass and Yellow Perch, as the demise of Embrey Dam has allowed these migratory species access to historical waters. Tidal Potomac River tributaries—including Aquia, Occoquan, and Pohick—should produce good catches of Largemouth Bass (LMB) but reduced catches of Northern Snakehead (NSH) in 2017. Electrofishing surveys in spring 2016 indicated bass numbers were above average and improved from 2015 – likely due to several years of good recruitment. Anglers should see improvements in LMB quantity and quality in 2017. NSH catch in most tributaries was reduced from recent years, as populations appeared to stabilize and even decline in areas where colonization occurred first (northern creeks between Stafford County and Alexandria). Creeks further south (e.g., Aquia) had higher densities. Anglers seeking snakeheads should target natural wood and docks before vegetation emerges then shift to spatterdock and Hydrilla edges later in the season. Fish very shallow! NSH harvest is encouraged (they have excellent culinary value), but they may only be possessed if deceased and reported to the Department (one way is to call 804-367-2925).